A Grand Canyon mule trip will make your visit to the canyon truly memorable. None of this "20 minutes at the rim lookout" for you! Still... it's a LONG way to the bottom of the Grand Canyon. You might want to sign up for the mule trip. This is not like taking a bus tour to see the sights. Remember you're RIDING those mules... for several miles! You can make this just a day trip part way into the canyon. 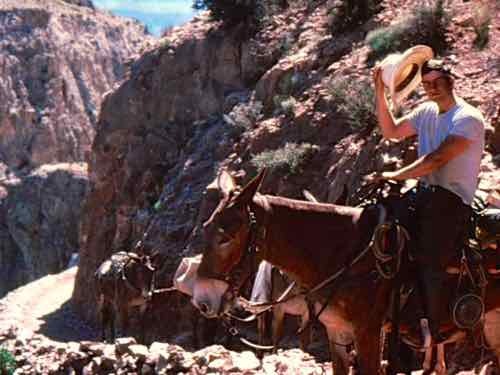 The mules will take you on a seven hour ride to Plateau Point on the Bright Angel Trail. Plateau Point offers a panoramic view of the canyon and the Colorado River. The mule trips can also be for those who want to head into the canyon for a night or two with a stay at Phantom Ranch. 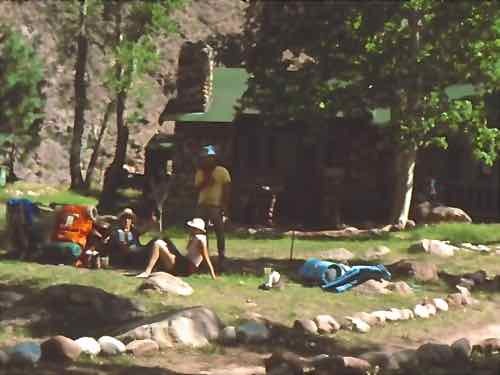 Phantom Ranch is the only lodging accommodation on the floor of the canyon. It has dormitory rooms and rustic cabins. 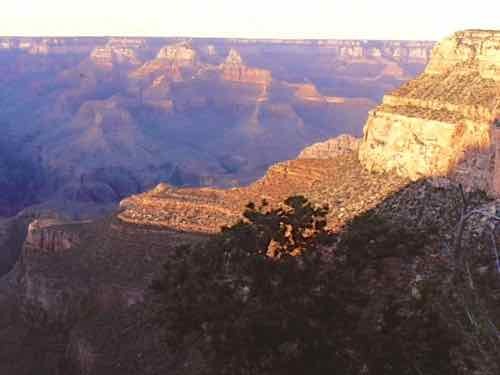 The overnight trips generally take riders down the Bright Angel Trail and up the South Kaibab Trail. The trails into the Grand Canyon are steep, and they can be hazardous. The sure footed mules have been carrying tourists and supplies into the canyon for years, and they have a great safety record, but you need to pay attention so they keep it that way. You will be led by wranglers who know the mules and the canyon well. You need to listen to what they tell you. They are larger than some horses. The mules are trained to walk on the outside of the trail - away from the canyon wall. This is so they don't brush up against the rocks with the supplies they are carrying.... or the tourists who are riding them. You're Not Afraid Of Heights Are You? I'm trying to tell you, you will also be on the outside edge of the trail. If you pass hikers, the hikers are expected to hug the rock wall and let the mules pass on the outside. So tall mules, walking on the outside.... get it? You will be hanging over the Grand Canyon! We were some of the hikers those Grand Canyon mule trips passed. Those riders looked like they were way up there. When we all got to Phantom Ranch, we weren't sure who was worse off... us with sore feet or the mule riders with sore.... well, you get what I mean, right? They were riding in those saddles for several hours! You don't have to be an expert rider to take a Grand Canyon mule trip. The wranglers will teach you the basics and watch over you. If you've never been a rider, or even if you have, be warned that you will probably be pretty sore after a five or six hour ride on the mules to the floor of the canyon. Riders must not weigh more than 200 pounds (91 kilograms). They will weigh you... with your clothes on. You must be at least 4 feet, 7 inches (1.38 meters) tall. And you must be able to speak and understand English so you can understand the wranglers.... their instructions and warnings are vital to a safe and fun trip. Even with all these caveats, these trips are very popular. Make reservations well in advance especially popular times. They accept reservations about a year in advance. This may not qualify as a way to play cowboy, but a Grand Canyon mule trip will be something you'll never forget.